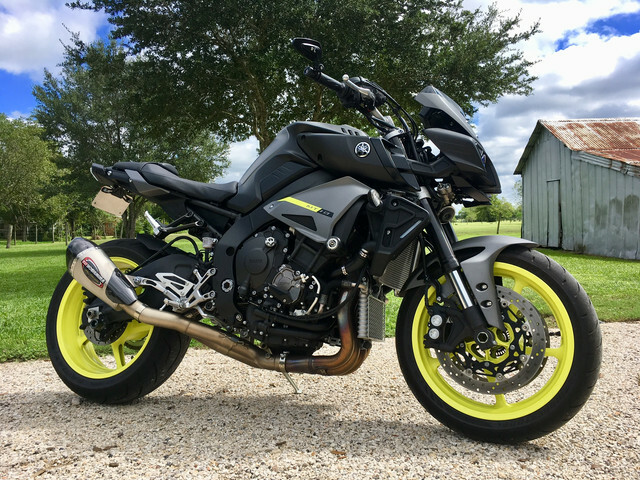 Hey everyone, I'm new to the forum and will be getting my 2018 MT-10 in a few days. I already have a few basic parts ordered and I have been doing a lot of research on which exhaust I should go with. I don't mind how loud it is as long as it sounds good. 1. Basic scorpion decat pipe, keep stock can for now and grab a slip on later down the line. 2. Austin Racing underbelly exit. 3. SP Engineering link pipe and slip on. Does anyone have any of these installed on their bikes? Hello Mtate, welcome to the forum! I agree. This is pretty general. At a high level, the can you choose won't matter as much as deleting the midpipe and getting the bike flashed. THe OEM can doesn't look too shabby, it's already titanium, and it's more or less a straight pipe so you don't increase flow by going to an aftermarket slipon. a lot of people like the AR look. If you're on a budget, a titanium link pipe is the best bang for your buck. 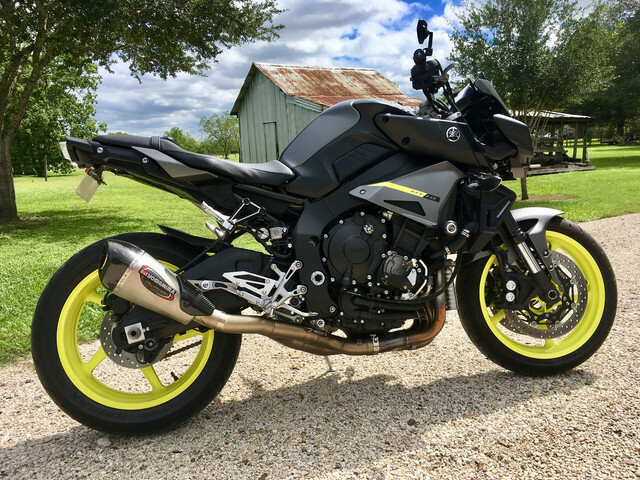 One thing I wish I knew before buying is that the performance increases from an exhaust upgrade are pretty limited according to the 2wdw dyno. Price isn't really to much of a worry of mine, I know the AR exhaust runs upwards of $1000, I would prefer to be under that obviously. I am leaning more so towards just getting a decat pipe but I can't see myself spending $550ish on the Akro link pipe. I found the Scorpion is only $260 but I can't find them in stock anywhere. I thought about the danmoto midpipe but saw a couple reviews about how it was poorly put together and that kind of put me off. I'll be pulling the trigger on something around the beginning of December where I can find a cold week that I can send my ECU off to get flashed and not worry to much about not being able to ride. Broke down most of this in my other reply. I know most of my power gains will come from an ECU flash. For looks, I would prefer not to have a giant can hanging off the back but i can compromise with something a little bigger if it flows well with the design of the bike. And, for sound I'm just looking for something more throaty rather than raspy. I want to sound like a monster roaring down the road rather than a bucket of bolts thats about to fall apart. Love my Yoshi Alfa T! Very loud and throaty. I loved the way they made there midpipe hug the bottom of the bike. $672 shipped. Mine is stainless. I have 2wdw flash. That link pipe does look real nice the way it hugs the bike. Doesn't have that noticeable gap that makes it look like it's just hanging on. I'll have to add that to my list of possibilities.